1. What is Global CEO Summit? 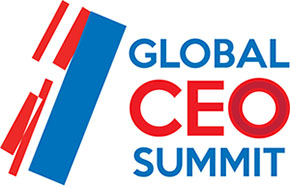 Global CEO Summit is a platform for direct dialog between leaders of Russian and foreign businesses with large-scale operations in Russia, and Russia's high-profile officials, including the President of Russia. The goal of the Summit is to enable business leaders to discuss impact of global and domestic trends on making business in Russia and to present their suggestions on Russian business climate improvement to Russia's government bodies. The Summit includes a number of major plenary sessions and individual cross-border dialogs with more limited set of participants. The Summit is held by the Russian Union of Industrialists and Entrepreneurs (RSPP) during St.Petersburg International Economic Forum (SPIEF) and on the basis of Forum's infrastructure in order to improve logistics for invitees and to ensure presence of vast number of global business leaders and Russian officials. 2. Who are the Summit participants? 3. Which events will the Summit include, where and when will they take place? Plenary sessions and international dialogs are held on May 22, 2014 the whole day through. For detailed information about topic, time and location of all Summit events, please refer to Summit Program section. 4. How to take part in Global CEO Summit? Participation in the Summit is permitted only by written invitation issued by its Organizing Committee. If you would like to participate in the Summit, please contact the Organizing Committee by May 12, 2014. You can find their contact details in the contacts section. If approved, a written invitation will be sent to you together with application form. Upon receiving the invitation, please send filled-in registration form to the Organizing Committee. After that your participation in the Summit is considered confirmed. 5. What about accommodation and other logistic issues (transport, visa support etc.)? 6. How to register and get access to the Summit events when I arrive at the Summit location? To visit the Summit events, guests are required to register at any registration desk of SPIEF (a dedicated Summit employee will be available at each desk.) Your ID is required for registration. After registration, a guest is provided with a personal badge which grants access to all Summit events and some Forum events. Please keep this badge to get access to these events. 7.How can I get printed materials for the Summit? Upon registration, all Summit guests will be provided with the Summit's agenda and theses of all plenary sessions. 8. Whom can I contact if I have any questions about the Summit?